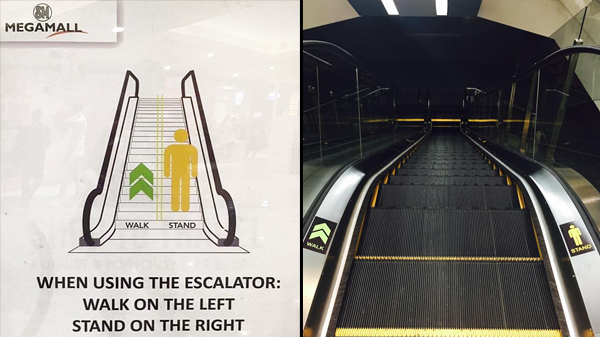 MANILA, Philippines – SM Supermalls recently launched a campaign in using the mall’s escalators which the public and the netizens have lauded approvingly. This “escalator etiquette” encourages all to stand on right and walk on left. A photo of what seems to be the mall’s concierge is standing beside a new friendly reminder by the SM Malls. “When using the escalator: Walk on the left. Stand on the right” it reads. The photo was posted last September 4 by a Facebook user Ken Lerona in SM Aura Premier. “Kudos to SM Supermalls for starting this discipline. It's about time we practice this. If we can abide by this rule in other countries, for sure we can do this in our own land,” said Lerona in the post. It quickly went viral with netizens applauding SM Malls in launching an “escalator etiquette.” It was shared 2,782 times with likes reached over 28,000 as of press time. “Hey Megashoppers! Let's start this discipline. It's about time we practice this. Happy shopping💫” the post reads. In the photo below, the SM Malls’ escalators has now signage on its deckboard. The yellow on the right is a stick-man figure with a ‘stand’ signage below its foot. Meaning the right side of the escalator is where to stand. While the left side is a figure of green arrow meant that the left side of the escalator is for those who want to walk. Have you also seen SM Mall’s new escalator campaign? Post your photos on the comment section below.